Some of you may have seen the news regarding the launch of a new (and at the moment the only) silver miners fund from Global X Funds, managed by a New York based company that issues a number of ETFs, including one for copper miners. The copper and silver miner funds started trading on April 20, 2010. SIL has a 0.65% expense ratio and is based on an index from a German based outfit at Structured-Solutions.eu. We think the fund (and its underlying index) provides a reasonable representation of the global silver miners sector. The fund's holdings can be viewed here. b) The overall inflation is not being "priced in" base metal stocks on this stretch. With gold currently trading around $1200 per ounce — an increase of almost five fold from 2001 — it is only natural to wonder how much gas is left in this tank. The fact is, we don’t know and we sort of don’t care. We’ve said it before and we’ll say it again: the real opportunity for wealth creation in the years ahead lies in the business of gold mining. The world is in the midst of a credit contraction, of the kind that always follows credit expansions. We have found from historical study that these contractions in credit tend to run for about twenty years. During every single prior credit contraction, the real price of gold, as measured against all commodities and assets, had increased. This increase in the real price of gold represents expansion in profit margin for the gold mining industry. Mr. Bernanke notes that the inflation signal isn’t confirmed by movements in other asset classes. Yields on Treasury bonds tend to rise when investors worry about inflation, but those yields have been falling recently. Inflation expectations as measured in Treasury Inflation Protected Securities (TIPS) markets remain low. And other commodity prices are falling. Gold is breaking records, but copper prices are down 17% so far this year. 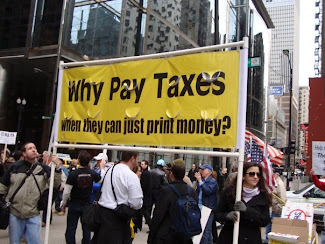 "I don’t fully understand movements in the gold price," Mr. Bernanke admitted. But he suggested it might be another example of investors fleeing risky assets and flocking to assets that are perceived as less risky, not only Treasury bonds, but also ones like gold. Keeping in mind this is the same person that still denies that the global economic downturn is a direct result of artificially low rates and a lack of financial regulation the Fed chairman sets the stage for his next epic fail by mistaking the only universally and voluntarily accepted form of money as a commodity. Gold is not a "commodity" and has never been since the Lydians minted the first gold coin in the world about 600 BC. The specimen pictured here weighs 4.71 grams, has a diameter of 13mm at its widest, and at 4mm, is thick as a nugget. It likely consists of about 55 percent gold, 43 percent silver, 2 percent copper, and trace amounts of lead and iron. It trades between $1,000 and $2,000 in numismatic cercles and has never devalued to zero purchasing power. Looking back in history reveals more clues that gold-backed money correlated highly with the prosperity of nations. 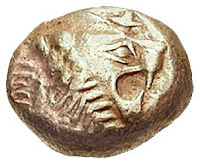 It is no coincidence that "solid" is derived from the Solidus coin. 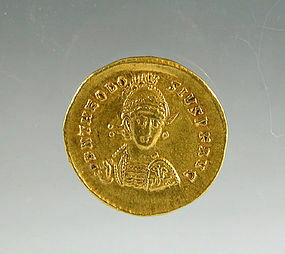 This coin was the standard in the Roman empire from the 4th to the 10th century. According to Wikipedia the coin was introduced by Emperor Constantin in 312 AD and was the accepted medium of exchange for 700 years because it kept its gold weight at 4.5 grams. BTW, these coins too have never devalued and now trade at 5-figure prices. Ben Bernanke may also have a look at the USA's own monetary history. America's first genuine economic boom happened under a gold standard after the failings of 2 central banks (who printed too much money.) 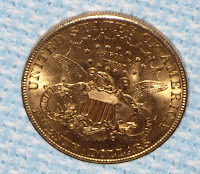 A gold ounce was worth $20 in 1815 and still the same 100 years later. Not that it blocked robber capitalism. The depicted Eagle coin has the same purchasing power today as 150 years ago: As $20 would buy you a Colt revolver then, today's Colt prices expressed in S terms range around $1,250. I like this comparison because neither gold nor a Colt has changed in the past. The 19th century can either be described as a free market paradise or "robber capitalism," depending whether your ancestors made it or not. A plurality of market participants do not place anymore trust into ECB President Jean-Claude Trichet. According to a quarterly survey by leading information provider Bloomberg 48% of those polled gave him an unfavorable rating, while 41 percent view him favorably. In January, Trichet received a 60 percent approval rating, with 27 percent regarding him negatively. The dissatisfaction with the ECB head gets more pointedly in investors' perception of the Eurozone crisis. 73% of respondents said a default of Greece is likely and only 23 % say they expect the region’s almost $1 trillion rescue package to both keep the European monetary union together and prevent a debt default by a government. More than 40% expect Greece to leave the Eurozone. 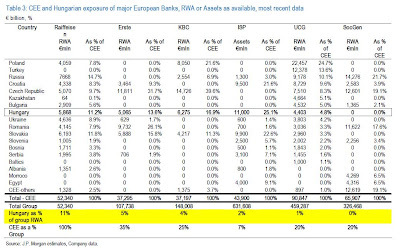 TABLE: JPMorgan had this comment: All in all, the situation should be broadly contained after the initial concerns and some of the banks that have exposure to Hungary and that suffered last week should reasonably see some relief, although we believe it is fair to say that investors will remain very wary, given last week’s seriously alarming messages. 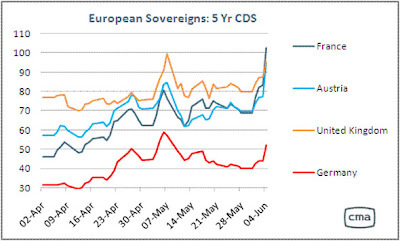 Indeed CEE region may attract further scrutiny by the market having been so far less touched by the events and concerns that have affected the Euro area. Click to enlarge. An unbacked currency can only take so many hits at one time. Bad news have been hitting the Euro fast and hard this year, driving the single currency to a new 4 1/2-year low of $1.1876 in early Monday trading. The latest shot into the body of the single currency comes from the German constitutional court which may impose a temporary injunction against Germany's participation in the unworkable €750 billion bailout package envisaged by the EU and the IMF, influential German magazine Der Spiegel wrote on Friday. The constitutional court has received a complaint by christian conservative MP Peter Gauweiler, a member of Angela Merkel's coalition, who sees Germany endangered by guarantees to weaker Euro members. GRAPH: The Euro plunged to a new 4 1/2-year low of $1.1876 in early Monday trading as none of its problems disappeared while another fundamental roadblock will delay the proposed unworkable €750 billion aid package. A member of Germany's ruling coalition has called on the constitutional court to block it and German economists warn of negative consequences for their own economy. Chart courtesy of Yahoo. Click to enlarge. 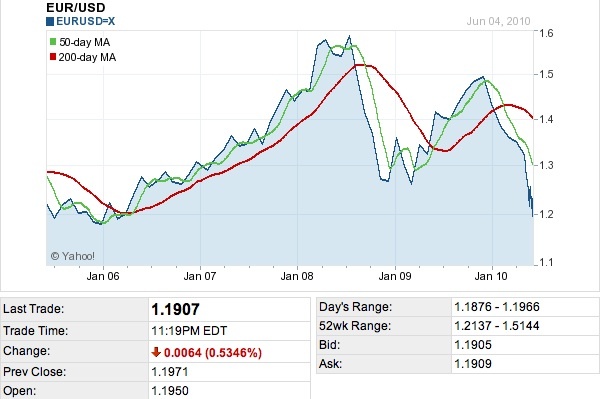 This blog has been warning since 2009 that Austria may be in the eye of the Eurozone storm. Mr. Market has followed up in the past 2 months. 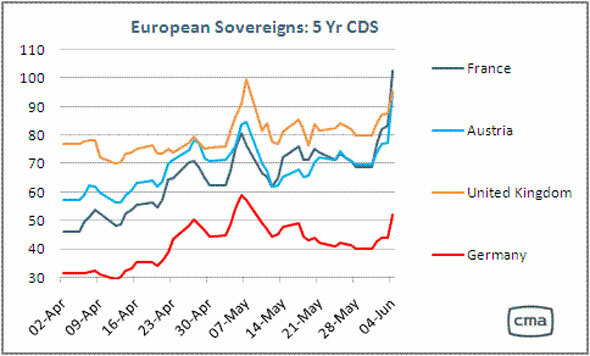 CDS prices to insure government debt from Austria, France and Germany exploded on Friday as the thesis that indebted countries cannot save other broke nations appears to find more followers. Here is a piece of witty common sense. This video is highly recommended for politicians who have yet to find out that fighting debt with more debt cannot work. 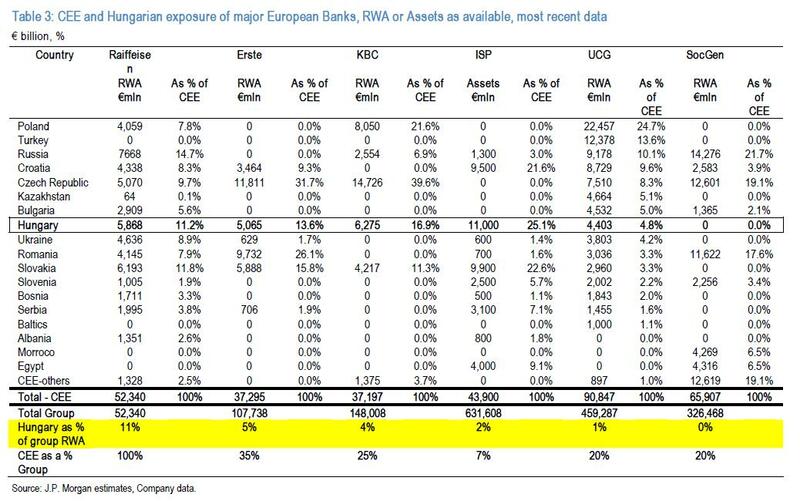 The European Central Bank (ECB) published a release on Wednesday that gives insight about who will be responsible for specific management issues. The assignments will take effect immediately. It was not communicated how responsibilities were shared before and surfing the ECB's webpages about its internal organisation do not deliver a clue on the past structure either. Austrian central bank governor Ewald Nowotny said on Tuesday the European Central Bank (ECB) will not offer new 12-month repos after the expiration of the first such tender with a volume of €442 billion on July 1. Two more 12-month liquidity operations are due on September 30 and December 23.
adding that the ECB may implement other measures should new liquidity needs arise. Nowotny also blasted rating agency Fitch for downgrading Spain to AA+ from its former AAA rating, saying that every action designed to raise volatility in markets would be of little help to calm markets. This blogger begins to wonder on what star central bankers reside. All the recent downgrades from Greece to Portugal have effectively come after the fact of rapidly deteriorating public finances, continuing the 4-decade old "tradition" that rating agencies always only acted after the fact. It is no coincidence to watch the Euro traded at a 4-year low against (equally worthless) Federal Reserve Notes (FRN) when markets talk about a necessary downgrade of France and Italy while the rating agencies stay mum on this delicate issue that would raise financing costs for de facto bankrupt Eurozone members. Public debts are on the rise in the whole Eurozone and this may not abate until 2026.